The Table Medal you are looking at came from a russian ruler series which covers the rulers of Russia from Rurik to Emperor Paul I, and are consecutively numbered. Made in the 19th century. In dark bronze, size 38mm. 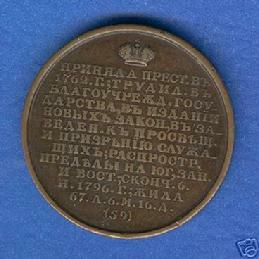 This is #59 medal of the Russian Ruler Series. 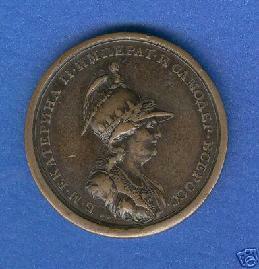 Reverse: She accepted the throne in 1762. She worked for the good organization of the state, for the issuance of new laws, for institutes to educate those who served her. She broadened the borders to the south, the west and the east. Died Nov. 6, 1796. She lived 67 years 6 months 16 days.